“I was afraid of you and avoided you,” a colleague once told me. Again, I received those same words from another person who attended my church. Wow! I learned their feelings after I got saved. Even then, I was amazed at their words, and even more that they avoided me because of fear. I thank God for those whom I met along the way who represented Christ to the point I coveted what they had. They were not brow-beating me with a fire-brimstone message trying to force me to being saved, but they simply displayed love and devotion to God through their actions and deeds. Neither were they afraid to engage in conversations with me that included a broad spectrum of topics including faith. Every day we encounter people in the marketplace. We cannot be afraid to interact with them. We cannot become so holy that we can’t even hold a decent conversation with them, because we use religious jargon that repels and not compels. Love and kindness is what draws, not pious conversations that are steeped in condemnation and judgment. You want to make such an impact that you love people to want what you have. How do we love people to want to serve the Lord through business? How do we become that person of influence for someone to say that I want to live for the Lord? You may never say that you need to be saved, but your life speaks volumes that causes them to want to be saved. It worked for me! We have to be that way in the marketplace where people covet what we have. Not because we are beating them down and not because we are afraid to associate with them, but because we love them. Love and kindness, have I drawn thee. As they watch us, they see God through us in our actions, our work ethic and how we extend love to them regardless of how they treat us. God is calling for us to go out into the 21st century mission-field, the marketplace, and draw them through love and kindness. How loving is your light? Do your words align with your actions and deeds? Are you afraid to engage others in a conversation?. What do you need? I need a Father…a Pastor, I responded like a child who had been battered and abused. 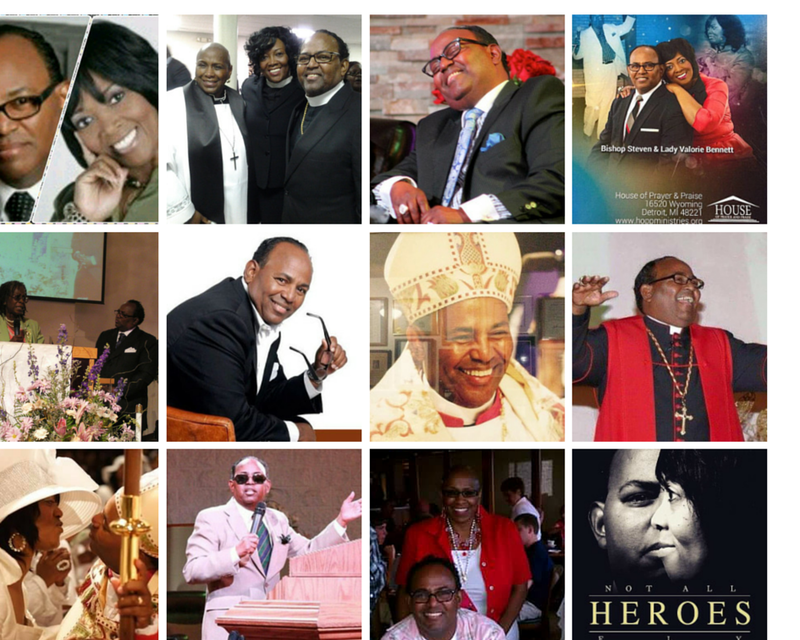 That was one of my first encounters with Bishop Steven J. Bennett more than eight years ago. As I sat in his office tattered and torn, I was in desperate need of a safe haven to heal and mend. Bishop Bennett flung open the doors of House & Prayer & Praise and his heart. 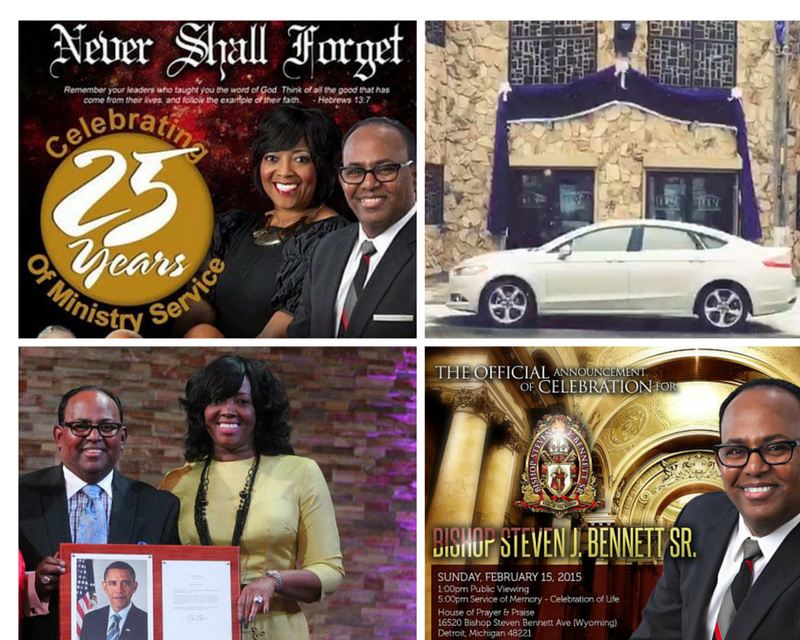 Perusing the many remembrances of Bishop Bennett, they resonate that this was a special man…an extraordinary man of character and integrity. He touched the hearts of bishops as much as he touched the hearts of the ordinary guy. He had a way with people that brought them into a place of comfort where they could just be themselves. Bishop Bennett was a Father in every sense of the word. He taught how to pray hard, praise hard and play hard while doing it with intensity of worship until the Lord. For me it was “freedom church.” You were free to be you. He didn’t teach the strongholds of religion, but the freedom in relationship. His life was a demonstrative orchestration of righteousness, integrity and living the abundant life in King Jesus in every arena of his life. One of my favorite moments was when he would gaze over at Lady Val and begin to bellow Stevie Wonder’s song, “Knocks Me Off My Feet”. This expression of his unyielding love resonated in celebration of his love and commitment to the covenant of marriage that he espoused as an exemplary husband and father. Even as I write this email, I will never forget one Wednesday evening when Bishop Bennett told everyone to give me their emails so I could send an inspirational message to them every week. 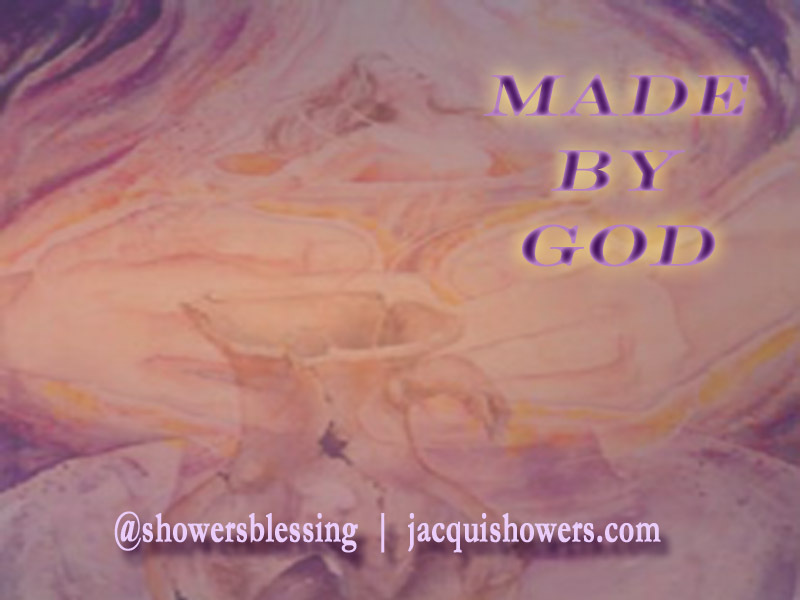 He had no idea that God had told me that very thing, yet I was reluctant about doing it. He was always the pusher who believed in your dreams and not afraid to push you there. He wasn’t afraid to push you forward while providing you with incredible leadership. Not long after coming to House of Prayer & Praise I was planning to host a conference. I had been searching for a venue when Bishop Bennett walked up to me and said, “I really want you to have the event here.” I was overjoyed and elated. Oh Break Out had a home! He had come to me and I didn’t have to be concern about his motives or clandestine actions. Both he and Lady Val has always been extremely supportive. Wow! What a concept? A few years down the road, Bishop Bennett stopped me after service. He stated that I was a business woman and I did it well. Then he proceeded to say that it is time for me to take Oh Break Out out of House of Prayer & Praise because it is a business conference and not a church service. He went on to say that I needed to take it to a hotel. The very next year we hosted Oh Break Out at a hotel. Believe me I was scared. All of my expenses increased. I felt that if he believed in me, I had no choice but to do it. I did. It was a huge success. Bishop would always wonder how in the world I was able to do all the things I did. His belief in my faith walk was so encouraging, because sometimes it was hard to walk. Just before Oh Break Out last year, Bishop Bennett said to me that he was glad that he wasn’t me. He said, “God never gave me to do anything where I didn’t have any money! Jacqui your faith is so big.” I said to him that I was glad that I wasn’t him because he had to pastor all of these people and deal with their diverse personalities. He encouraged me to move Oh Break Out back a few months and I heeded his instruction. I valued his insight and input as a leader and as a Spiritual Father. I will truly miss his wise loving counsel and instruction. Bishop Bennett was a remarkable man. Words can’t adequately express the breadth and depth of his greatness. He is an unsung hero. Every life he touched feels the impact of this incredible lost. For me, there is a major void in my life. I lost a true Father, yet I am not fatherless. His teachings, love, joy and instructions are with me always as I carry on. Bishop Bennett was a remarkable man. Words can’t adequately express the breadth and depth of his greatness. When I was growing up quality was attached to anything made in America. Americans took pride in everything manufactured and produced in this country and so did everyone else around the world. There weren’t any questions about how well it was made, because you knew the inherent quality that went into making it. It was this pride that led us to know that quality had gone into every detail. We automatically knew it would wear better, operate more efficiently, and last longer; simply because it was manufactured and made in America. Each manufacturer coveted a stamp of approval and was proud to display, “Made in America” on their products. There is a label inside of us that says, “Made by God.” When you become the person God created you to be all of humankind can look at you and know there is a standard of quality that has gone into you that is second to none. Are you representig the label well in the marketplace? Father, Bless me to become all You created. More than anyone else, You alone know who you created me to be. Continue to mold and shape me for your purpose and for your glory. In the process, the person you envisioned will emerge and everyone will know that I am a product of the One who fearfully and wonderfully made me to be a marketplace influencer. Amen. Sometimes you hear something and it smacks you right between the eyes. That happened to me. It was at a time when I had too much to do and not enough time. It was overwhelming even thinking about it. Then I heard the proverbial question, “Why Me?” I perked up. In essence, this was my sentiment. Before we even embark on the assignment we view it as being unfair and too daunting a task for us. Who is God to call upon us to do what we may deem to be impossible. For some reason we feel He has no idea about our limitations or our time. If I recall He said that it is not by our might or power, but by His Spirit. Our problem is that we have difficulty moving from our fear-based thinking into His faith-based results. Well, as I sat there listening to the message, I realized that I had no choice but to do all of it. Do I have time? I feel I don’t, but I realize I don’t have the time not to do it. Whenever we encounter assignments we can’t accomplish by our own might we must move quickly from our limited mindset into God’s unlimited omnipotence. He knows our limitations. He created us. It is in our limitation that He can show Himself strong. It is in our limitation that He is glorified. By the time the speaker finished, I realized I had to do it all. Feeling sorry for myself was not going to change the situation. I simply had to jump in and just do it. Why me? Why not me? There comes a time when you move from why me to why not me. 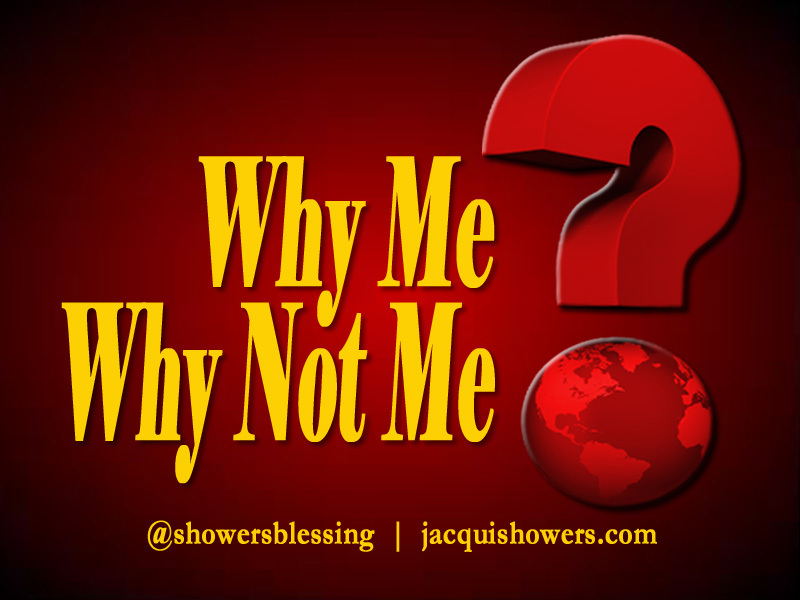 I’m no longer a why me whiner, but a why not me executor. Why me? Am I too afraid? So, Why not me? Father, Bless me to move beyond the limitations of my thoughts and fears, and to embrace the unlimited potential You have placed inside of me. Why me is no longer a part of vernacular as I move into why not me. As long as I glorify You in all I do, success becomes a common occurrence. With each successful achievement, I owe all glory to You. Amen. God’s promises propel you beyond your past in order to achieve the dreams and desires inherent in your future. The reason your past has a hold on you is because you have not taken a hold of your past. When you take hold of your past and no longer allow your past to govern your life, you begin to understand God’s planned future is more powerful than the stronghold of your past. Your past conquests drive your future quests. Your past has a stronghold on your present and prevents you from having faith in the future God has for you. Your past causes you to focus on your failures more than your triumphs. Your failures in life are the mountains God says we can speak to and say be thou removed and cast into the sea. A mountain builds up over time and can become either a monument or a detriment. You make the determination in the present. Because what you do in the present drives your past conquests and your future quests. Whatever you do today determines your future but it conquers your past. So your past no longer has control over your present and your future. We operate in the timelessness of eternity. Eternal time is all the same. That is where the conquering begins because we begin operating in God’s framework of time and not the world’s. The world’s time is chronological. God gave us chronological time so we can understand the seasons and the days and when the end was drawing nigh. That is why it is said that a day to God is like a thousand years because of eternal time. People get trapped in the past because they have not locked into the eternity of God and their past becomes more powerful than their future. When they begin to operate in God’s season of eternity they begin to conquer the past and their past becomes their friend as opposed to being their foe. You have to understand that yesterday was your present, today was your future. Now yesterday is your past, today is your present and tomorrow is your future. The only way you can begin to achieve an eternal mindset, is when your present conquers your past and propels you into the future God envisioned. What holds you back from pursuing your dreams? Are you paralyzed from the disappointments of your past? What are you going to do to move past this impasse and pursue with passion all God has for you? Father, Sometimes I get so bogged down by my past I can’t move forward and enjoy the prosperous future You envisioned for me. Please help me to overcome my past, as I take control of my present, and You propel me to future successes unimaginable. Amen. “I was afraid of you and would avoid you,” a colleague once told me who I worked with. Then I received those same comments from another person who attended the same church. Wow! I learned their feelings after I got saved. Even then, I was amazed at their words and even more that they avoided me because of fear. I thank God for those whom I met along the way who represented Christ to the point I coveted what they had. They were not brow-beating me with a fire-brimstone message trying to force me to be saved, but they simply displayed love and devotion to God through their actions and deeds. Neither were they afraid to engage in conversation with me that included a broad spectrum of topics including faith. We encounter people every day in the marketplace and we cannot be afraid to interact with them. We cannot become so holy that we can’t even hold a decent conversation with them because we use all of this religious jargon that repels and not compels. Love and kindness is what draws, not pious conversations that are steeped in condemnation. You want to make such an impact that you love people to Christ. How do we love people to want to serve the Lord through business? How do we become that person of influence for someone to say that I want to live for the Lord? You may never say that you need to be saved, but your life speaks volumes that causes them to want to be saved. It worked for me! We have to be that way in the marketplace where people covet what we have. Not because we are beating them down and not because we are even afraid to associate with them, but because we love them. Love and kindness have I drawn thee. 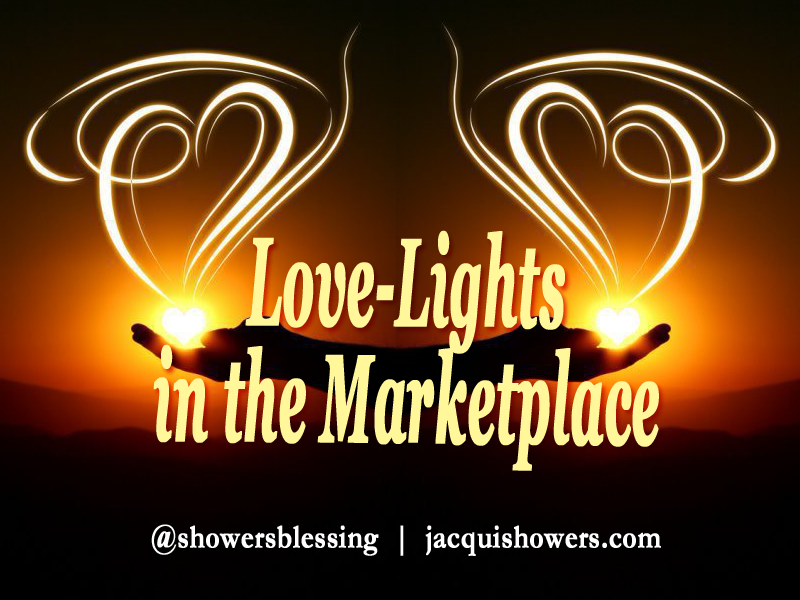 God is calling for us to go out into the 21st century mission-field and draw them through love and kindness as we work heartily to glorify God as love-lights in the marketplace. 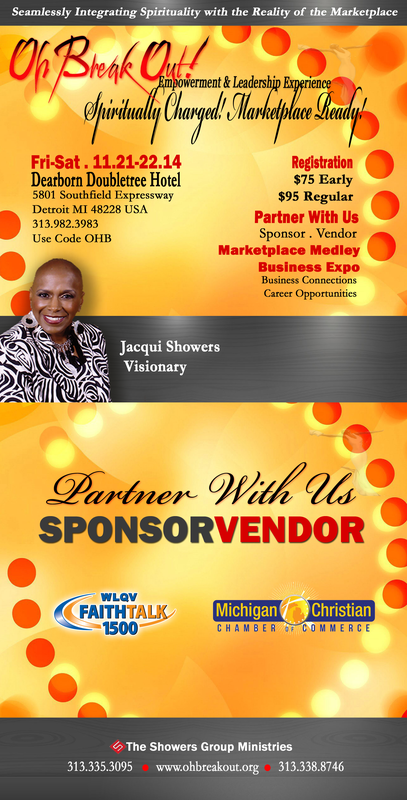 The Oh Break Out Empowerment & Leadership Experience’s mandate is to ensure you are empowered to walk out your faith at work and to seamlessly integrate your spirituality with the reality of the marketplace. We’re less than a month away, register to learn how you can integrate faith @ work at Oh Break Out. It’s going to be epic! Father, Bless me to be that love-light You have strategically assigned for Your Glory. All who come into my sphere of influence, I will shower them with love and kindness as You do the drawing. Bless my actions and deeds to speak louder than my words as a powerful witness in the marketplace. Amen. My nephew taught me the game is not over until the clock hits :00. When I first started watching basketball if my team was ahead at the two minute mark I just knew they had won the game. Much to my chagrin points slipped away and they would lose it all. I was upset. Immediately I would called my nephew and exclaim, “What happened!” He educated me that there is a whole lot of time left in the game at the two minute mark and the other team can easily steal the game and win it all. Now, rather than get excited when my team is winning and there are only two minutes left in the game, I rally even more. 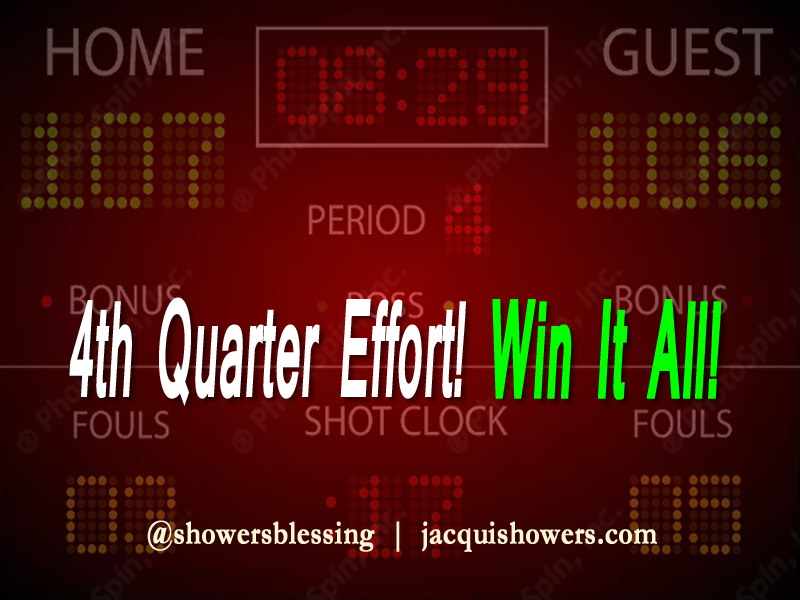 You can still win in the fourth quarter, where you may have been losing terribly. I’ve witnessed too many times where teams came back in the fourth quarter and won it all. You can do the same thing too. We find ourselves in the fourth quarter of the year. We started out with much anticipation that we were going to win and achieve everything we set out to do. All of a sudden, the fourth quarter is here and you feel as though time is slipping away. You frantically come up with play after play to achieve success to make sure when the clock hits :00 you’ve won. Let me tell you, don’t get frantic. Just get busy. Get busy accomplishing those things that you know you can do. Get busy establishing a daily routine of success. Get busy making the calls. . .writing that book. . .planning the event. . .painting that portrait or whatever you need to do.Just get busy! Pour yourself into it. Aim high and achieve even higher! This is the fourth quarter. Time has already passed and you can’t go back, but you can redeem the time by making sure you maximize your efforts in this final quarter. Achieve success by taking control of your time as you execute your talents with the skill, focus, agility and relentlessness of a clutch player. They come alive because they know it is now or never. They give it their all. Be that clutch player! Defeat whatever forces are trying to make you lose the game. The clock is ticking! Make the final shot! Swooooooosh! You’ve won it all! Are you that clutch player? Leave a comment. I want to know what are you doing to make sure your final play is a winning one. 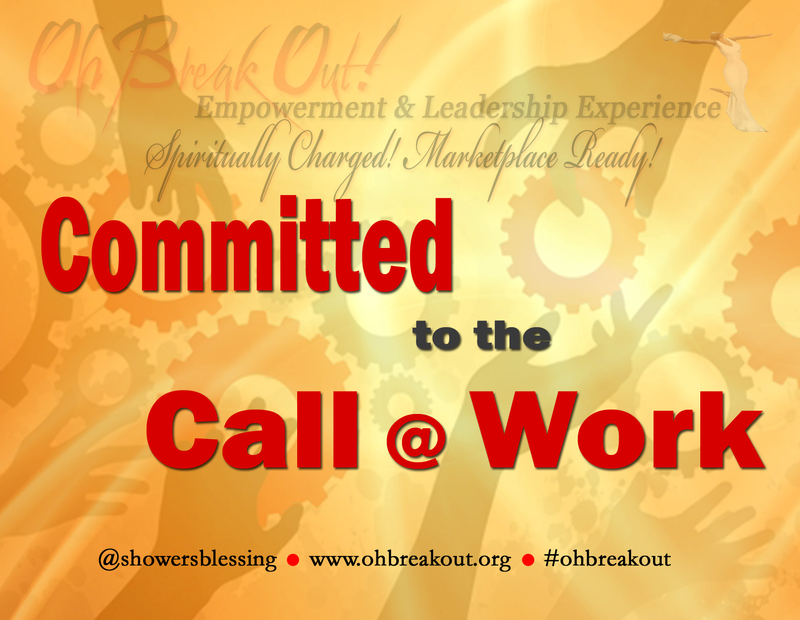 The Oh Break Out Empowerment & Leadership Experience’s mandate is to ensure you are empowered to walk out your faith at work and to seamlessly integrate your spirituality with the reality of the marketplace. Learn more how you can integrate faith @ work at Oh Break Out by register during the earlybird @ $75. It’s going to be epic! Father, TThis year has passed so swiftly. Although I had so many goals I wanted to achieve, I find myself in its final quarter. I have determined within myself that I will not give up, but I will achieve everything I set out to do. Although I may not have been as diligent as I should have been, I will not allow that to prevent me from finishing big. I will do whatever it takes to make sure when the clock winds down on this final quarter of the year, I have given it my all to glorify You! I am more than a conqueror! I am running this race to success! Thank You God! I’m a winner! Amen. 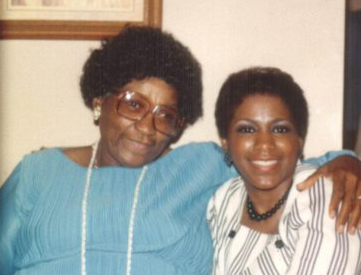 “I heard you when you first drove up,” my mother would say when you kept asking her something repeatedly. It is a nice way of saying that you didn’t have to keep asking her the same thing over and over again. In that instance, you would stop asking and know that whatever you were asking for she was going to give it to you. You had to wait for it. Isn’t that the way it is with prayer. We ask God and feel as though He does not hear us because the answer does not come to us quickly. You can’t give up either. You have to understand that when you first starting praying God heard your petition. It wasn’t that He wasn’t doing anything about it, He was at the outset. However, we are more spirit than flesh and you must understand that when our prayers go forth God immediately dispatches His angels; conversely the enemy releases His imps as well. Once the enemy sees that God has released His angels to help you, He immediately assigns one of his imps to prevent them from getting to you. We’re not wrestling against the flesh and blood of this world; but the battle is waged against wickedness and principalities in high places in the spirit realm. You can’t give up. You don’t want to give up right at the point of breakthrough. Pray until God says, “I heard you when you first drove up.” In that instance the peace of God lets you know that God has already answered your prayers and petitions before you uttered one word. Not only do your prayers reach God at the onset of their release, but they also are a major catalyst that keeps the angels fighting to get the answer to you from God. Your prayers play a critical role in letting God know you have not given up. It informs God that you are in the battle with Him and the angels that He has released on your behalf. From God’s hearing your prayers, to the release of the angels and their battling in the heavenlies and on to your praying on earth, this trilogy of power annihilates the most strategic attack of the enemy. You can never ever give up. God is JEJIT! He is always just enough just in time. 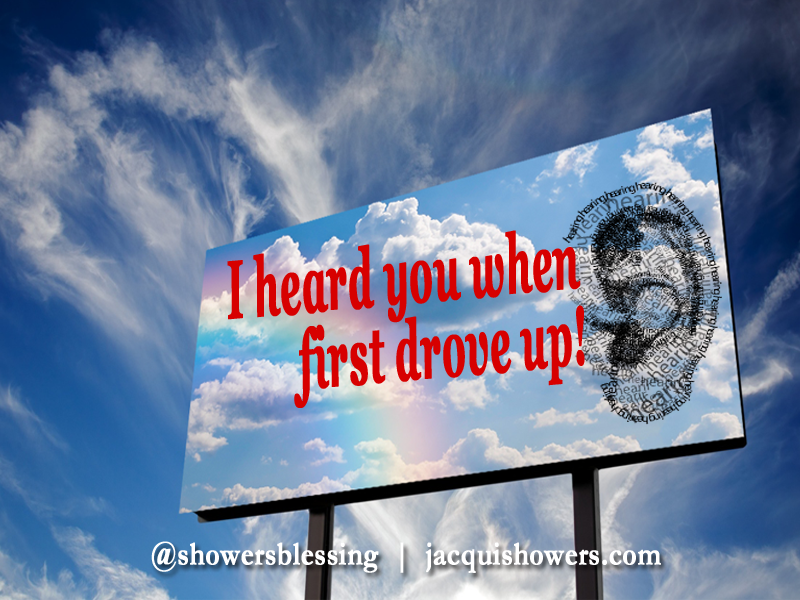 Keep praying and listening for, “I heard you when you first drove up.” The answered prayer has already been answered. What is happening that may cause you to give up? Do you feel God hears your prayers? Do you understand what praying through is all about? Leave a comment, I would love to hear about the challenges you are conquering through prayer. Father, Thank you for answering my prayers. Though the answer may appear to tarry, I will never stop seeking You in prayer until You give me peace. I know that before I spoke it, You had already answered; and before I prayed it You had already heard my prayers and dispatched Your angels on my behalf and for my success. Amen. Attending elementary school I remember missionaries who came once a week to share the Word of God with us. Two scriptures I learned from those women who were committed to sharing the Gospel with kids under the age of 12 were Romans 3:6 and James 1:22. I still remember reciting the prayer of salvation with them. Although I always attended church it was something special about this moment. It was a time when America was proud of its foundation being based on the Word of God. It was a time before this perceived notion of separation of church was forcing people to be afraid to share their faith. It was a time when every child had to know the pledge of allegiance and spoke with pride, “…one nation under God.” Prayer was encouraged and God was not being pushed out, but an integral part of our lives. As these foundational principles were forced out of schools the element that took its place has cost us the lives of our children, too numerous to count. It was a time when you could walk through school doors without metal detectors for fear of a kid having a weapon of mass destruction or some unwelcomed intruder. It is ironic how we hold fast to this premise as that invisible wall becomes taller and wider. It has infiltrated our lives. Yet we are at a major threshold of opportunities. Like those ladies who were committed to sharing the message did not allow misrepresented premises stop them, we have to be willing every single day to take our faith to work. You see, we are the lights others may never encounter. If we refuse or are too afraid to be those lights are we truly fulfilling the great commission? That is not to say that you are to be some religious zealot, but it is to say that you have a mandate to go into all the world. That world includes the workplace…it includes the marketplace. No different than a pastor who have been called to a church, you have been called to the workplace. You have been assigned to a respective place and people regardless of their position. Move from merely having a job to working in your calling. If we continue to remain in the four confining walls of church and not willing to move beyond those walls, we will miss a great opportunity of revival. We attend worship services on Sunday so we can be built up to go out into the world on Monday. The marketplace, the 21st century mission field, needs our presence and God. Not for us to be too timid to even operate in our calling, but for us to be bold in our walk as conduits of the message. Don’t get me wrong. This doesn’t mean you become so overbearing you repel people away rather than compel them. It does mean you are ready, equipped and prepared to meet with those who may come to you in secret as Nicodemus did with Jesus. The Oh Break Out Empowerment & Leadership Experience’s mandate is to ensure you are empowered to walk out your faith at work and to seamlessly integrate your spirituality with the reality of the marketplace. We’re so committed we’ve established a special registration of $55 for a limited time. Learn more how you can integrate faith @ work at Oh Break Out by registering before September 20. It’s going to be epic! Do you represent the Kingdom in the marketplace? Do you compel or repel? What measures are you using to become equipped? 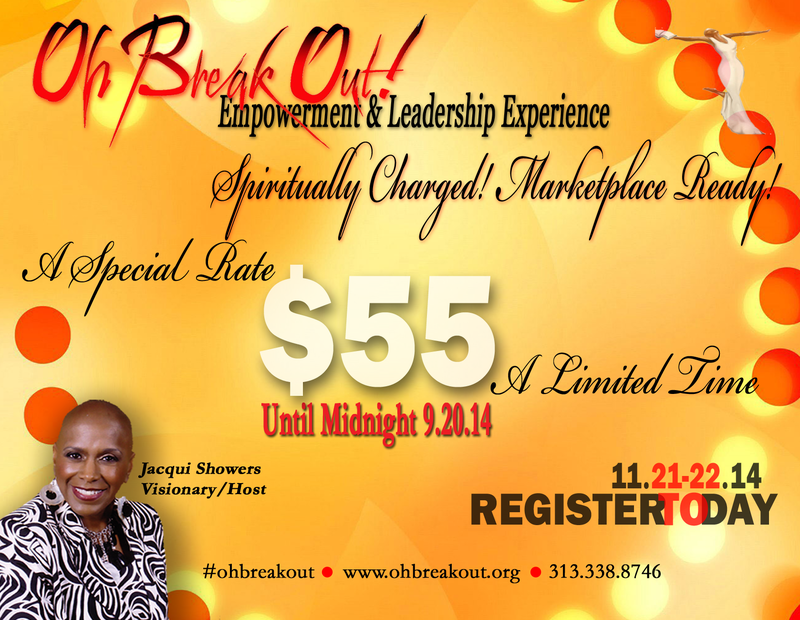 Have you registered for Oh Break Out Empowerment & Leadership Experience? Leave your comments below. Father, There are many who desire to know You through me. Bless me to be a conduit of the message committed to sharing it at my job. Bless me to gird myself spiritually so those that come to me wanting to know Christ, I will be able to share the good news. Bless me to walk uprightly before them so my life beckons them to want to know You. Amen.